The Gist Task Plus Chair is not just another chair – Gist is a solution for your work environment – multiple customizable adjustments including back support, arms, height, custom upholstery, and more. 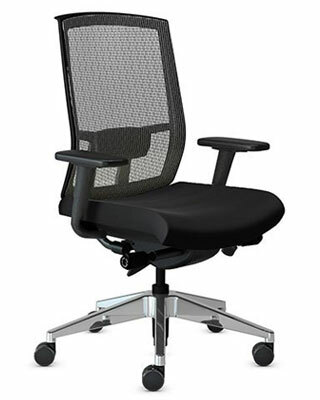 Standard with synchro tilt mechanism, height adjustment, seat slider, tilt tension and tilt lock. Mesh Highback with black mesh woven with curved silver strands that reflect light. Soft, pressure fit back support with vertical adjustment to fit any user. Task Plus+ additionally features a polished aluminum base and width adjustable arms. Outer dimensions: 26 1/2"W x 23 to 25"D x 37 3/4 to 41 3/4"H (Width on Plus+ is 25 1/2 to 27"). Seated area dimensions: 18"W x 17 1/2 to 19 1/2"D x 22 1/4"H (Width on Plus+ is 18 to 19 1/2"). Seat height: 17 1/2 to 21". 300 lb. maximum weight rated. Easy to assemble in 4 steps.